GLOBAL VOLUNTARY CAMPS LTD. is a PUBLIC COMPANY LIMITED BY GUARANTEEE, a non-profit organisation registered in Singapore. The registration no. is 200913332C. 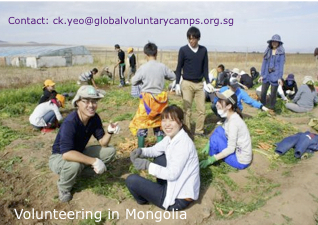 The proposed activities focus on international voluntary service in Asia Pacific where volunteers from all over the world live & work together with local people for environmental & cultural protection, social justice, rural & human development, and other causes. Projects would be for 2-3 weeks. Most of the partner organisations we work with are affiliated with CCIVS (Coordinating Committee for International Voluntary Service) founded by UNESCO, UN in 1948 to assist & promote workcamps in the world.